Up next in our week-long tour of my reader Cristi’s home is her kitchen and breakfast area. I have been eating up every little inch of this space since I first laid eyes on it! 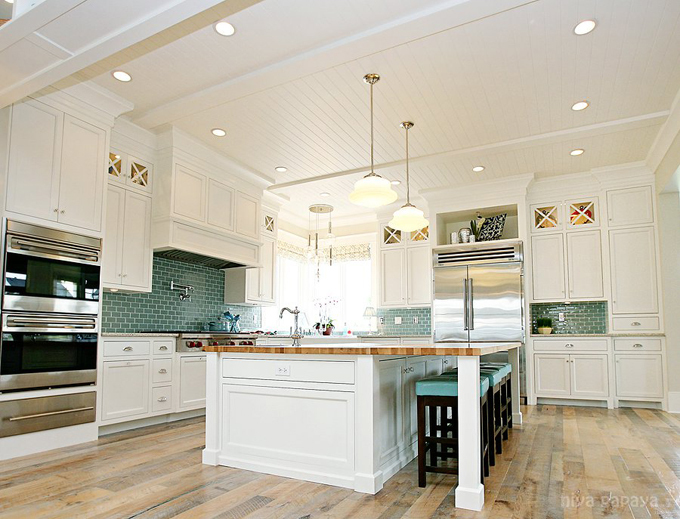 Nothing is prettier than a white kitchen warmed up with beautiful hardwood flooring and colorful tiles. You may remember from yesterday that all the floor in the home was reclaimed from an old barn out east. Love that. Did you notice the closeup of the countertop? 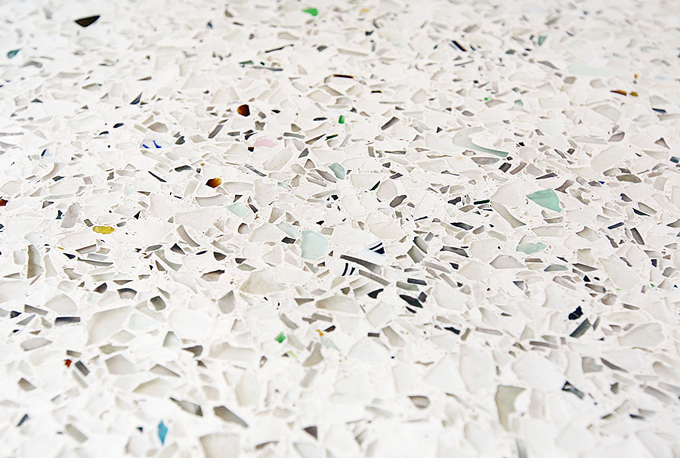 This company called Vetrazzo makes them out of recycled glass…you can even read words on some of the pieces. So much cooler than granite, don’t you think?? The cabinets were all done by Benjamin Blackwelder, who actually made the kitchen so specifically to Cristi’s height (she’s only 5’0″ tall) that the island was measured out by her standing on telephone books! The tile was all done by Greg’s Tile Creations (you’ll love what they did in the bathrooms too). Cristi and her designer Lindy Allen picked them out Contempo Tile. What dream kitchen would be without its own perfect little breakfast nook?! Cristi and Jeff designed the area to be east-facing so it would get plenty of the morning sunlight. 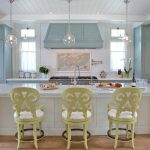 I just love those bold tufted chairs from 4-chairs.com! The “coco mirror” from West Elm is another one of Cristi’s favorite things in the house – it’s made out of bleached coconut shells! 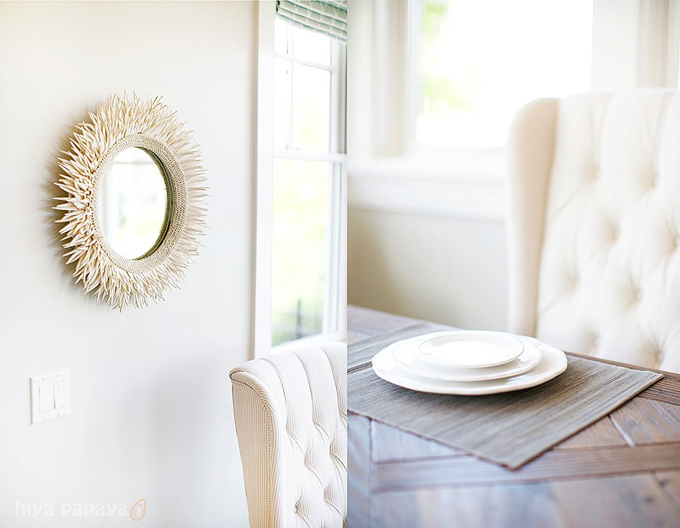 Thanks to the homeowner Cristi and Jessi Safsten of Hiya Papaya for all these gorgeous images! I’ll be back tomorrow with some really cool and super fun spaces from this home! Here is source info as requested! This home is spectacular! 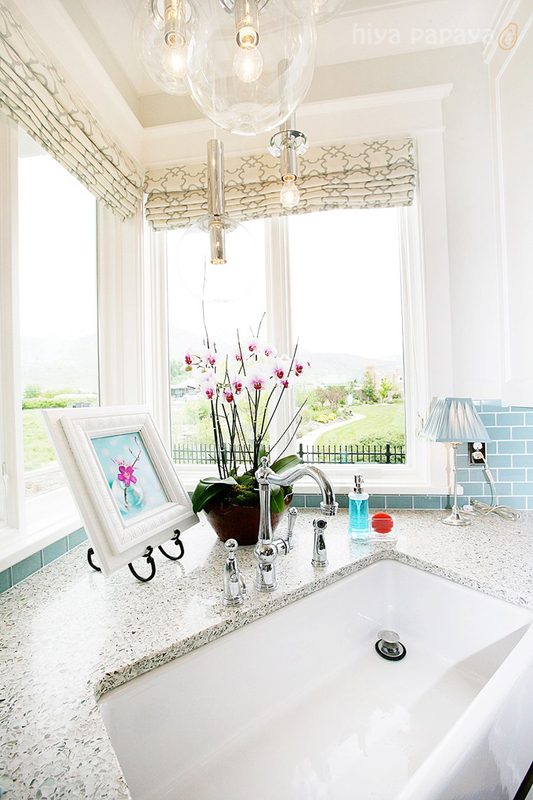 I love the recycled countertops and the farmhouse sink in the corner! 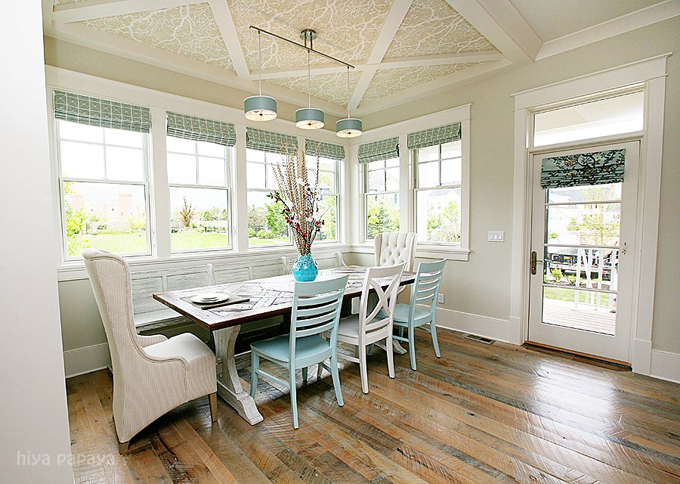 I also am dying over the woodplanked flooring and the ceiling treatment above the dining area! Thank you for the beautiful inspiration! Lordy. I am addicted to this tour. This home is just amazing. The floors slay me. Wow, I'm speechless. This house is absolutely stunning!!! I'm in love! OMG! This has got to be one of my favorite interiors of all time now!! I can't believe you still have more to come! I'm so excited!! Those countertops are soooooooo good and I love the barn wood on Day two and the floor in the entrance as well! Lordy is right! I am so over granite so these countertops are a real treat for the eyes. Geezus, it is so serene but the pops of color really zing. Are those really hot pink knobs on the stove? Love everything. I am loving this home! There are so many great elements! I especially LOVE those floors! Great work!! I have found myself waking up the last 2 days looking forward to seeing another room of this house! IT's AMAZING! Love those barstools and the countertops! Great punches of color. As others have commented, this house is beyond gorgeous! The upholstered chairs are to die for. I have one question (as I often do when looking at photos of beautiful living rooms)- where are the cords for the lamps… where are they being plugged in?! I would love to know the answer. Thank you! I almost passsed out from joy when seeing this kitchen! I live in Utah – close to them and would almost pay her to see this beauty in person. In fact I already called Greg's Tile for a estimate to come do my kitchen backsplash! I can't thank you enough for showing this amazing home! I am speechless, so it's going to be a little difficult to leave a comment 🙂 I ADORE this home! 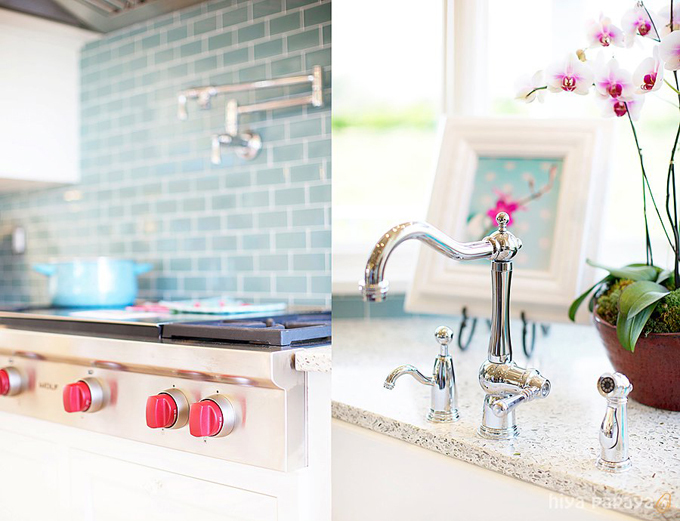 I want to redo my kitchen yesterday, and make it as light, bright and gorgeous as this one. I need to go back and look at all the details again, as I was scrolling through very excitedly the first go-round! I love the super subtle touches of color. I would be happy in this kitchen. It makes me smile. Oh dear, that kitchen counter i amazing! Anonymous – we actually planned for the lamps in the living room when we were building and had outlets built into the floors. Then we covered them up with the rugs. So they are, indeed, plugged in! Searching – if you live in Utah and really do want to come see this house, it's currently in the Utah Valley Parade of Homes. It's #14 on the tour – in Lindon. So come on by! We'd love to have you! Abode Love – the ceiling treatment above the dining table is wallpaper from Thibaut. Hope all this info helps! Keep the questions coming and I'll answer them the best I can! SO glad you all love the home!! Lovely!! Please source the window fabric in eating area and on the door (shade)? so pretty! What a stunning home! I would love to know the source for the light fixtures above the sink and above the table. Love every inch. The floors caught my eye first! Absolutely stunning! I just love the fabrics used the shades on the windows and door. Do you know where these are from? Thanks! Erin I want to cook and eat in that kitchen! Love that they used recycled glass counter tops too. Hi Cristi, What is the name/colr of the counter? So I know what to tell Vetrazzo if we wanted to copy the counter into our own home! So bright and happy. I am absolutely in love with everything about this house. I love the touch of pink details and the counter tops. Everything is perfect. 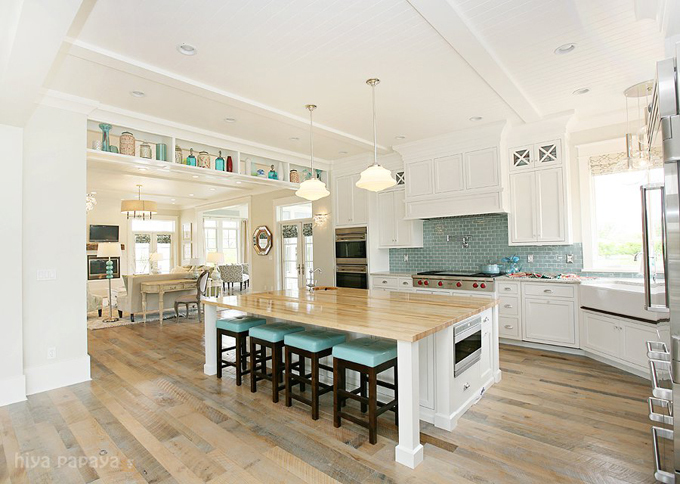 Will you tell us your source for the gorgeous schoolhouse pendants above the island? I've been thinking about getting some, now I'm completely sure I have to! I wish I was in Utah right now to go see your house. I'll be visiting after the parade ends, darn it! My house is similar in a lot of ways, but I am feeling inspired to give it some tweaking to make it gorgeous like yours. Thanks for sharing with us! I am quite amazed by how MANY people love this beachy style and react to it so strongly. The breakfast/dining room light came from lampsplus.com. Although it was on clearance when we bought it (for less than $100!!! Can you believe that?!) so I'm not sure if it's still available. But still check out their website. They have GREAT light fixtures – really good quality and customer service and they are NOT expensive. Loved using them! The exact color of our vetrazzo recycled glass countertops is Glass House. Okay (PHEW – huge sigh! Ha ha!) I think that is all for now. Let me know if there are any more questions! Hope this info helps at least a little!! Sorry it's not exact! Glad I hit reload to get the edits. I had been wondering about the lovely wallpaper on that nook ceiling. There are some lovely ceiling treatments throughout not just the beautiful floors. Where did you get the lights above the island? I particularly like those. Color scheme is divine. 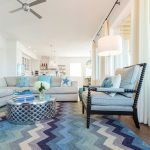 I'm a sucker for coastal design. I must say, as a real estate agent who has seen 1,000's of houses, this house is uh-may-zing! Are these the same island pendants? Kincaids – YES!!! You found them and I couldn't (I'm doing my Charlie Brown defeated dance right now! Ha ha!) SO glad you got them . Hudson Valley – that's the brand! THANK YOU! Do you know color the kitchen cabinets are? Are they also done in the dove white? Most amazing home. I walked through it and I fell in love. Yes, the kitchen cabinets are dove white. So glad you loved the home! Thanks for coming through! Wow, this is such an inspiring home. Can you tell me more about the wallpaper in the nook with the yellow settee/bench? The bench has yellow and white striped pillows, and it was an area featured in day 1 of the tour. Thanks for sharing! Thank you Kincaids for the link to the island pendants. I eagerly await the next installment. Saving all these links too, helpful for remodeling. Every day I find something about this house I like more than the last. The kitchen is stunning and that blacksplash – what a heavenly colour. The selection of fabrics and wallpapers are really lovely. So enjoying this little wander through your home Cristi. Thanks for sharing and the introduction from the lovely Erin. Thanks also for visiting my blog and commenting. I've been a fan of yours for so long, it's a thrill to have you visit. This kitchen leaves me breathless, seriously, it is gorgeous, and that is an understatement!!!! Wow I love it!!!! Even the ceilings are gorgeous… LOVE the wood planks especially! There's so much to see – that farmhouse sink in the corner is calling my name! Fabulous job – what a wonderful place to make memories!! I love the recycled glass countertops! Love the post! Love your blog! Such a happy home! THis might be my fav kitchen ever! Love the countertops and the colors! It's amazing. Okay, I have taken the entire house tour and can I just say that I now feel so inadequate .. but so inspired. I could post every one of these photos on Pinterest, and I just might! This house is gorgeous from the outside to the inside, and every bit of it fits my taste to a tee. Can you and I go and just live there? Wowzadoodle- I love it! The kitchen finishes are to die for! Or, just drool for! The Shade Store is wonderful about sending fabric very quickly. I got the Plumes design in jade as shown on the door, but also ordered Bloom in jade and love it! How could I find if there is something close in a wallpaper? Can you tell me where the counters tools are from? 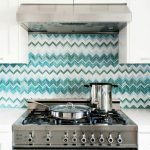 Would you please tell me about the backsplash tile? Is it glass? I looked at Contempo Tile but can't tell. Ack…I love it all!! I love that you are answering questions. I just loved your home when I toured it. Your style is so perfect! Ever since I saw your kitchen, I knew that that dining area is what I want. Where did you get that bench? It's just beautiful. You guys! Sorry I haven't been good at answering your questions. I've been on pregnancy bed rest. The bar stools came from Four Chairs Furniture. Katie, sorry you couldn't find the tile at Contempo! 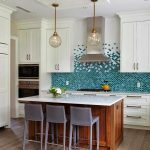 It is turquoise glass subway tiles. And thanks, The Kern's! What a compliment! The stool in the dining area also came from Four Chairs Furniture. thats amazing. If you are interested in lighting you should check out http://sabineslightfixtures.com. They do interesting things with lighting and light fixtures. Christy, if you happen to see this, could you please fill me in on the finish process for your wood floors? I am getting reclaimed oak fenceboards for my floors. I was going to stain them, but after seeing yours I almost hate to cover them with a dark stain. Are yours pickled or do they just have a clear finish? Oh my I love this house…exactly the look I am trying to accomplish as I redo mine. Quick question and I apologize if it has already been answered…the blue chairs in the breakfast nook…did you purchase those or paint them? If painted…do you happen to know the color blue they are? It is exactly what I am looking for. Who was the builder or Contractor? Can you give me any info on the flooring? It's to die for! What brand is the apron front sink? Is it fireclay or cast iron? And how tall are your baseboards? I can't decide on a height for our house! …. I told you, weird questions! I love the simplicity of the shades above your kitchen sink. I see links for the fabric around your table and on the door but not for those. Any ideas? Thanks!! I'm sorry if I missed it but I cannot find the color or brand of the tile as your turquoise glass backsplash. I have been trying to find them but I am not having any luck. Thank you! I also just went to contempo tile. Is it vetro crystal blue? Please tell us! Beautiful! !